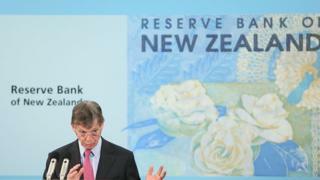 The Reserve Bank of New Zealand (RBNZ) has cut its benchmark interest rate for the fourth time since June. The central bank cut rates from 2.75% to 2.5%, saying the country's economy had "softened" in 2015. It is the world's largest dairy exporter and has been hit by a fall in international prices. The move was widely expected by economists as the country continues to see lower inflation levels due to the strength of the New Zealand dollar. Despite the rate cut, New Zealand's dollar rose in mid morning trade against the US dollar. The country's currency has risen since August "partly reversing the depreciation that occurred from April", RBNZ governor Graeme Wheeler said. "The rise in the exchange rate is unhelpful and further depreciation would be appropriate in order to support sustainable growth," he said. Core inflation was below the 1% to 3% target range, "mainly due to the earlier strength in the New Zealand dollar and the 65% fall in world oil prices since mid-2014," he added. However, Mr Graeme was positive about the outlook for inflation and for economic growth into 2016. "The inflation rate is expected to move inside the target range from early 2016, as earlier petrol price declines will drop out of the annual calculation, and the lower New Zealand dollar will be reflected in higher tradables prices," he said. "A recovery in export prices, the recent lift in confidence, and increasing domestic demand from the rising population are expected to see growth strengthen over the coming year," he added. The bank predicted economic growth of 2.4% in the first three months of next year when compared to the same quarter a year earlier. New Zealand's central bank cut rates in June, July and September, but held steady in October. New Zealand exports some 95% of its milk production - with 87% of that collected by Fonterra, the world's biggest dairy exporter. The country's dairy exports have been hurt though by falling prices internationally together with a slowdown of its major trading partner China - a big buyer of its dairy products. However, there are hopes that dairy prices globally will start to rise next year. On Thursday, Fonterra decided to hold its forecast for farmgate milk prices steady, which it said reflected a view that international diary prices would continue to improve in the first half of next year.